During the holidays, there is so much to think about and plan, it can be easy to lose focus when it comes to your health. There were a series of events in our lives that contributed to my daughter experiencing her first pain crisis from sickle-cell anemia. If I could turn back the hands of time, here are some reminders I would give myself. 1. Watch what you consume. During the Christmas holiday, I was sick from a stomach virus, eventually my daughters became sick as well. I’m not sure what we ate that made us ill, but something caused us to experience symptoms longer than 24 hours, which caused our immune systems to weaken. While visiting family it’s so easy to allow your kids to put their bedtime routines aside and stay up for as long as they want, but during the holidays they need rest to help keep their bodies healthy. This year in the bitter cold, I allowed my daughter to stay up and welcome in the new year with me and my friends as we watched fireworks. In hindsight, she probably would have enjoyed watching fireworks the next day on TV just as much. Holidays seems to flood people’s homes with sugary treats that are hard to resist. Sugar cookies, pies, ice-cream, candy etc. Unfortunately, sugar weakens immune systems. 4. Always have your winter car kit in your car. This year in one week we travelled up and down the east coast, experiencing drastically different temperatures in a very short amount of time. Unfortunately by the end of the next week my daughter’s body had experienced all it could. Water is the source of life! 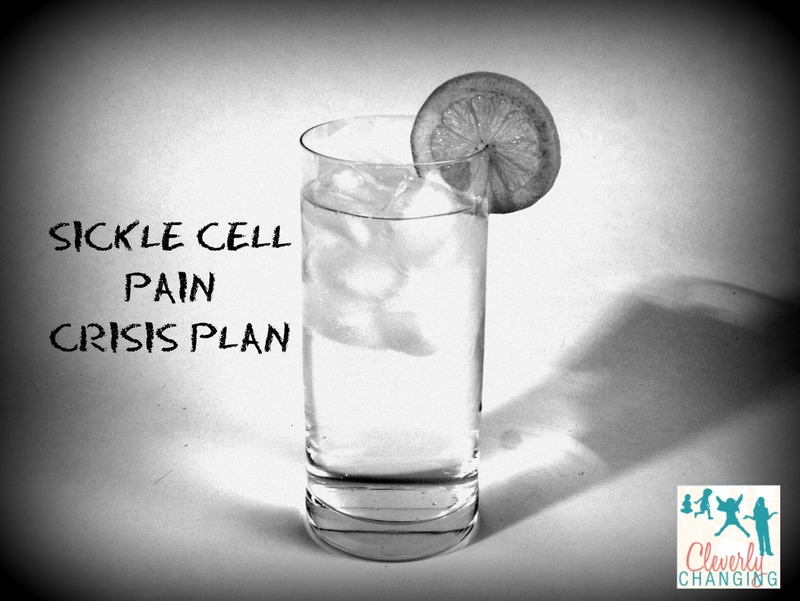 If you have a child with Sickle Cell Disorder, water helps keep the blood from sickling and sticking together. DON’T EVER LET YOUR CHILD GET DEHYDRATED! Staying hydrated helps prevent sickle-cell symptoms. When it is too hot or too cold, it is hard for a person living with sickle cell’s body to adapt to these temperatures well. Moderate temperatures are more manageable. 8. Don’t take any health issues for granted. Fact: My daughter has Sickle Cell Anemia. She experienced her first pain crisis this week. Prior to Wednesday my knowledge of a pain crisis was limited, I had read about it, seen videos, but I had never experienced it first hand. On Wednesday after being in the cold for about 30 minutes my daughter told us that she was hurting. Within an hour the pain had escalated from tearful cries, to pain they hindered her from being able to walk. Immediately, we began rehydrating her with water. She drank a cup of water every hour or two. We check her extremities and monitored her symptoms. We gave her ibuprofen to help ease her pain as directed by her doctor. We called her doctors and kept them informed about her and her body. The worse part about seeing my child in crisis was that while holding her, I could feel the pain causing her body to tremble and convulse. She felt attacked by the pain and there was nothing I could do to soothe her anxiety. Last night, was the first time we slept after her crisis. For now on, I will not take her health for granted and let our guard down. Stay ever vigilant and always on standby. Have a plan to stay Healthy and never deviate from that plan. Take Temperature. (Never go anywhere without your thermometer kit). Be cautious if your child’s fever is over 100 degrees for more than 24 hrs. Watch for swelling, jaundice, chest pain, stomach pain, etc (CALL THE DOCTOR FOR ADVICE if these symptoms occur). Have a pain journal and record symptoms. Record what was happening prior to the pain, the weather, how long the pain lasts etc. Keep some pain medicine on hand and administer according to instructions provided by the doctor. Keep your child comfortable and try to help keep his or her mind off the pain. Continue to stay with your child and monitor his or her symptoms.